The UK Extension Weed Science Group is conducting a Weed Science Training from 9 am – 3 pm. Two locations will be offered - June 23, 2015 - UK Research and Education Center (Princeton, KY) and June 25, 2015 - UK Spindletop Farm (Lexington, KY). The Weed Training will cover the following topics: Herbicide Resistant Weeds, New Herbicide Tolerant Crop Traits, Application Stewardship, Herbicide Symptomology, Weed Identification and Cover Crops in Weed Management. This program will be offered to UK Agriculture and Natural Resource Agents, other UK Agronomists, pesticide applicators, crop consultants, crop producers and agribusiness personnel. Commercial Pesticide Applicator Credits offered 2 general hrs and 2 specific (1A,10 and 12). CCA credits have also been requested. 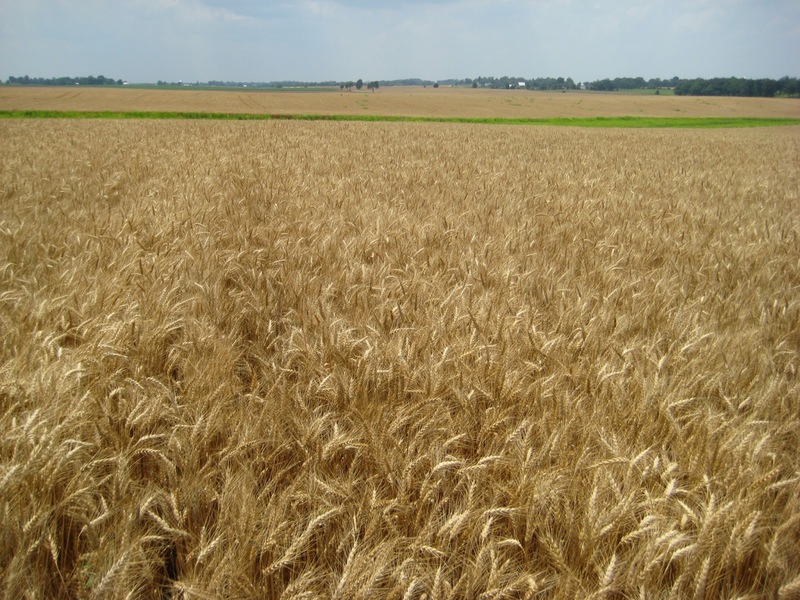 The 2015 Kentucky Extension Wheat Contest forms are available. Entries must be postmarked by July 24, 2015 for eligible entries. 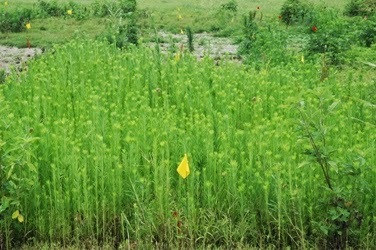 This corn field had numerous plants that were stunted with striped leaves. This field was adequate to high in soil test values and had proper pH. When we dug up some plants, we found that the majority of stunted plants suffered from sidewall compaction. Images of the field, the leaf symptoms and the compacted roots follow. Field where most of the corn appeared yellow with striped leaves. Cloudy skies and cool weather can make corn appear deficient. Leaf striping on corn is being reported across the state. 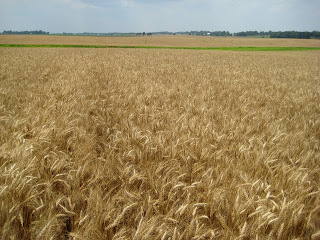 The recent cooler, cloudy weather is probably a big factor in many fields. In these cases, the symptoms are temporary or transient. They are cured by ample sunshine and warmer weather. Other fields have a legitimate deficiency. Soil testing will identify those deficiencies. A tissue test will likely show a deficiency, but won't explain why it is occurring. A soil test will explain why. If the soil is deficient, then apply the appropriate fertilizer if at all possible. If the soil is test is adequate or above, then wait for the sunshine. While pulling the soil test, dig up a few roots. Sidewall compaction can lead to these symptoms as well. I'm sure no one reading this post "mudded-in" corn. But your neighbors may have! Feel free to pass this along to them to check for sidewall compaction. If they have sidewall compaction, there is not much they can do. Sidewall compaction is a field where they should cut their losses and move on. Here are some previous articles on corn leaf striping.